Earth is the only planet where life is possible and comprises of an atmosphere, ecosystem and various land formations that are necessary for the survival. Earth is 70% covered by water and remaining part is covered by land. 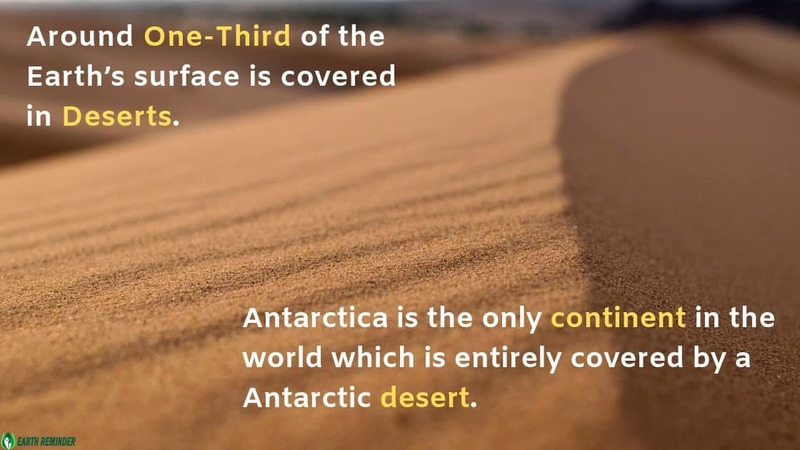 1/5th of the earth’s land is covered with deserts. Every continent on this earth has a desert and every desert has its own ecosystem which is known as Desert ecosystem. 1 WHAT IS A DESERT ECOSYSTEM? 3.1 WHY DESERT ECOSYSTEM IS IMPORTANT FOR EARTH? WHAT IS A DESERT ECOSYSTEM? An ecosystem is a community of all the living organism and non-living organisms interacting with each other in a specific area. Living organisms include all the organisms, plants and animals whereas non-living organisms include the physical environment that comprises air, water, sun, atmosphere, earth, climate etc. In simple terms, an ecosystem is a setting where all the living and non-living components interact in a physical environment. When we hear the word ‘desert’ the very first thing that strikes our minds is a big barren, abandoned and dry land without plants covered with sand. A desert can be hot and cold both. Desert is one of the most dried land areas on this planet that receives very little precipitation annually. It is a land with very less rainfall throughout the year measured less than 50 cm a year. Desert ecosystem is the driest ecosystem of the earth and this is the reason it has less vegetation and less diversity of life. It is one of the parts of the terrestrial ecosystem. The plants and animals of the desert ecosystem have mastered the art of survival in harsh conditions. A desert ecosystem is basically devoid of any rainfall or precipitation. In short desert, the ecosystem is the community of living and non-living organisms living together and interacting in an environment which seems to be abandoned. A Desert ecosystem is the interaction between both the Biotic and Abiotic components of the environment. It is the common characteristic of all the deserts on the earth. Aridity simply implies the deficiency of moistures or dryness. Desert experience very less rainfall and thus result in aridity. Less precipitation is one of the major features of deserts and also the reason behind the dryness. The rainfall in deserts is seasonal and occurs only for a limited duration. The annual rainfall that a desert receives every year is just 25-30 centimeters. Desert ecosystems experience extreme temperatures during day and night. The days are very hot and the nights can be extremely cold. It is the sole characteristic of all the desert ecosystems either hot or cold all lacks moisture. It tends to be very high in a desert ecosystem. This is the reason deserts experience sandstorms/ dust storms of high intensity resulting in the formation of huge sand dunes. Due to less rainfall, there is a shortage of water in a desert ecosystem. Due to the scarcity of water deserts have to face the situation of drought half of the year. The humidity level in a desert ecosystem is very low in the daytime and relatively high at night. In deserts is very low to grow vegetation. It is dry, rocky, thin, sandy, mainly grey in colour and has no organic contents like nitrogen, phosphorus etc which are essential for the growth of plants. However, the survival in a desert ecosystem is very hard but despite the fact, deserts are home to various plants and animals. The plants and animals have adapted to survive in the harsh and extreme conditions of the desert. Density Is very low in deserts and nearby areas as there is there a scarcity of water, food and climatic conditioner are too harsh. In this ecosystem that includes basically vegetations with spines like cacti that can easily survive in such conditions. Desert ecosystems do not exist only in hot and dry areas of the earth. You can a find a desert ecosystem in a tropical, arid, and even in extremely cold locations. Here we have shared information about all the types of Desert Ecosystem that exist on this earth. These kinds of the desert ecosystem have hot and dry climatic conditions through the air and have very low annual rainfall. The hot desert ecosystem is basically found in Central America, South Asia, North America, Africa, Australia etc. There are extreme variations in temperature and soil is rough and harsh. This desert ecosystem is quite similar to the Hot and Dry desert ecosystem. This kind of ecosystem has hard rocks, stable ground, less sand dunes. Temperature is not as extreme as a hot and dry desert ecosystem. Great Basin is an example of Semi-arid desert ecosystem. It receives a lot of rain as compared to the normal desert’s ecosystem. The Atacama Desert in Chile and Namib in Africa are a good example of Coastal desert ecosystem. Such desert ecosystems are found near the coastal lines of big water bodies like oceans and seas and are generally affected by the ocean currents. Winter fogs are common here. They are more hospitable than other desert ecosystem and therefore they have a more flora and fauna than others. This desert ecosystem comprises of abundant rainfall throughout the winters and less in summers and generally has chilling winters with snowfall. The summers are short, moderately hot and moist here. These are usually covered with snow dunes. Such desert ecosystem can be found in Greenland, Antarctica, and Nearctic realm. 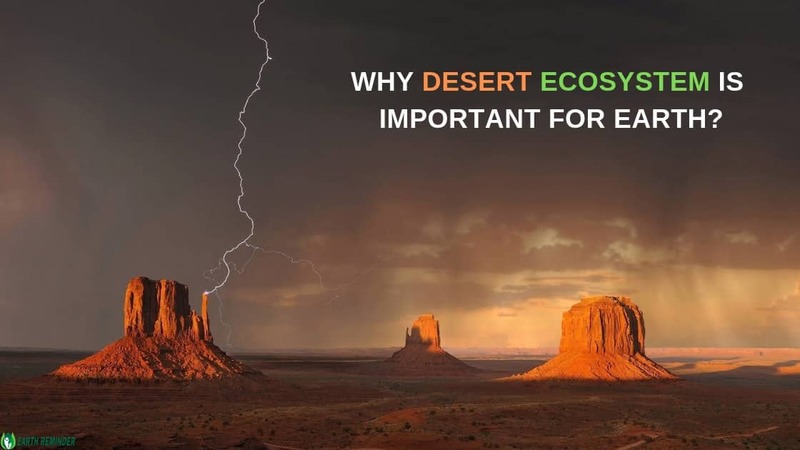 WHY DESERT ECOSYSTEM IS IMPORTANT FOR EARTH? It is usually considered as the waste and useless land. However, the literal meaning of desert (Desertus- latin word) is waste but the truth is a desert ecosystem is a significant part of the earth like other ecosystems. No matter they are dry, receives less rainfall, have less biodiversity but they are a part of earth and help in maintaining a balance. Desert ecosystem is habitat to various species of plants and animals. These plants have adapted to survive in an extreme environment. It is also important as they act as carbon sink which means the bacteria in the sand helps to store the carbon dioxide and prevent it from entering into the atmosphere. This ecosystem is a big source of minerals and natural gas and oil. Also, check ways to save natural resources to protect the ecosystem. Desert ecosystem is usually for the production of salt. This kind of ecosystem if ideal for the preservation of historical remains artefacts. Thus, deserts have great significance in archaeological discoveries. Deserts have unusual landscape and oasis and people around the world get attracted to the scenic beauty of such natural formation. Therefore, deserts are important tourist locations. In totality, it is a crucial part of this earth and is beneficial for plants, animals, human beings and the environment of the earth. We should not forget that a desert ecosystem is arid and dry but it is full of life and beauty.